As a wife of a business traveler, and the one responsible for all the travel planning and booking in our family, I’ve found that the ''WiFi“ filter most booking sites are offering to narrow down the list of potential hotels is simply outdated. Most hotels say they provide WiFi, but if it’s actually working is a different story. What I need to know is how good and reliable it is. I’ve been traveling with my husband and spent close to 200 hotel nights in Asia this year, all being in 3.5-5 star hotels that have listed that they provide WiFi. However, more often than not, the connection is not good enough for an uninterrupted video conference. If I then made the mistake of booking the hotel for the entire week, I’ve put my husband in a real bind. Because of the high stakes I need to do a lot of research before I make a booking and I really wish there was an easier way to get a sense of the actual WiFi situation is at the hotels I’m considering. Let me show you my current booking process. First I filter the hotels by those who provides WiFi. Most hotel booking sites, like this one from Hotels.com, is letting me filter hotels by “Free WiFi”. But FREE is not really the essential part to me, if WiFi is an important filter to a user, it’s not going to be enough that the hotel is listing that they have it, but it actually needs to be working well. Expedia lets you select whether or not you’re traveling for business, but they’re just saying they will show you popular business features. It’s not clear how they are filtering the results and there’s not any more information in the listing than what you’d get if you had just checked off for the “Free WiFi” filter. Instead of “Free Wifi” Expedia is letting you filter by “High-Speed Internet”. However, I’m not sure what the criteria for high-speed Internet is versus regular WiFi. Do they mean wired? Once I have all the tabs open for the hotels that fit the bill, I check the reviews for each listing looking for comments about the WiFi. Some booking sites show a score for WiFi, but I have a hard time trusting it as I don’t really know the reference point for that score. Good enough for checking your email or good enough for streaming Netflix? Many hotels that has a good score for WiFi still has many reviews that says WiFi is non-existent or disconnects you a lot. Booking.com is letting guests score the WiFi. 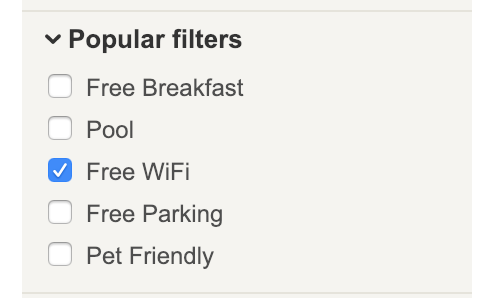 Booking.com shows an “Excellent WiFi” badge on some hotel listings, but they won’t let me use this as a filter to find only hotels that have been rated with Excellent WiFi. TripAdvisor and Booking.com lets you easily filter reviews to find people who are commenting on the wifi. But even then, it’s rarely a consensus of the quality as the connection can vary greatly depending on where your room are relative to the router or depending on what you need the Internet to be good enough for. To cater to those who think that good and reliable WiFi is a dealbreaker when booking a hotel room, there are a few things the booking sites could do to make it easier to find a hotel that would be a good fit. It would be helpful to ask them to score relative to something objective. Should be able to see reviews from guests staying at the exact room you are thinking of booking due to distance to router, firewalls etc. Offer verified listings for business travelers that has been rated by staff on features like WiFi connection.